This just may be the ugliest of the famous sweaters series. 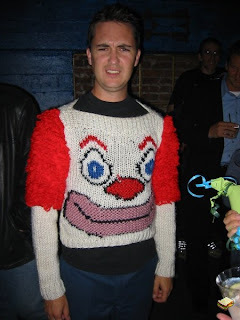 The story about the sweater has floated around the Internet for years. "I found this sweater at the Salvation Army thrift store on Valencia Street in San Francisco a few years ago. It cost me $3.75. It has proved to be a good investment. 1) "M" a relative size, this sweater stretches a lot as can be witnessed below. 3) "100% ACRYLIC, hand wash cold, do not twist or wring. reshape. dry flat touch up with warm iron on reverse side as necessary. do not dry clean. rn 50148. made in Korea." Wow, this one is ugly! There is several famous sweaters from The Killing series, so called Sarah Lund sweaters.